DO NOT USE LCDs from the Sega GameGear and/or the Atari Lynx. They are not NTSC compatible. The GameGear can be made NTSC compatible with the TV tuner that is an accessory sold separatedly but you will find that you are paying more than for most pocket LCD TVs in the market. Besides if you went ahead and use a pair of Sega GameGear as viewers for a HMD, I am sure that you will be displease by the coarse resolution. The Atari Lynx has more res than the GameGear but it is still inadequate for VR immersion. Using a pair of VictorMaxx Stuntmaster would work but the resolution is even worse. DO NOT BUY LCDs from Radio Shack. I am sorry that if some of you would disagree with me on this but I am talking from experience. One of my first HMD was built from hi-res 3.3″ LCDs I hacked from some pocket TVs I bought from Radio Shack and now it doesn’t work because I can’t find replacement parts that only Radio Shack sold. I lost about $170 because some small surface mounted diodes and transistors were damaged by my novice soldering skills. I then lost $30 to long distance phone calls pursuing these parts all over America and even Japan. I could have easily fixed my damaged TV sets if only Radio Shack was cooperative of giving me the neccessary information I would have needed to make my own power supply to run the LCDs. This information I seeked was just the values of a handful of crucial surface mounted devices. Now Radio Shack does not have 85% of the parts I would have needed if the damage was worse. That is why I say don’t buy from Radio Shack. STICK WITH THE MAJOR BRANDS like Sony, Casio, JVC, Sharp, etc. They manufacture their own products and you have a better chance finding parts from them down the road when you may need them (the backlight for example). Go to your local elctronics stores and check out anything with LCDs (e.g. 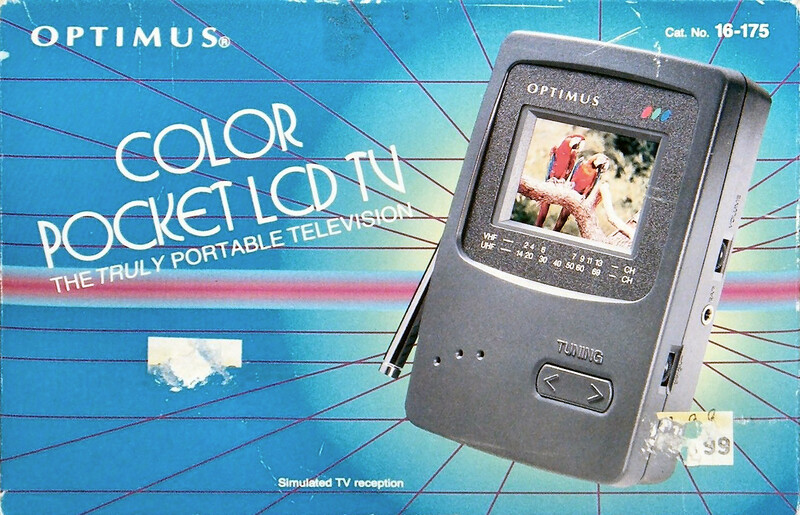 pocket TVs, camcorders, and even laptops). Really examine these LCDs if you don’t care what others think take your optics with you. I would stand in Montgomery Wards really eyeballing the LCD TVs and camcorders with my assortment of fresnel, arcrylic, glass lenses. Once you make your list, get in contact with as many technicians/TV repairmen you can who are knowledgeable of LCD products. Ask them what is the complexity of disassembling these LCD products from their housing and modifying them to lightweight and still functional. Then ask if they have the service manuals to these LCD products in their shops so that you can hopefully see them for yourself. Now call the manufacturers for prices of the LCDs, all neccessary parts to give it a composite video signal, and the servie manual. Try to find out how many years these parts will be available. I highly advise that you don’t buy soon to be discontinued products because of the uncertainty of available parts. If you decide to do it…I am with you every step of the way. If you have any questions just e-mail me. I even have some circuits that you can put together that will enhance the performance of your HMD. I forgot to discuss the use of VGA LCDs as viewers for HMD….well you probably have an idea what I was going to say. If any of you want me to go into that possiblity, feel free to e-mail with that your request. I pretty sure that I have pissed of some of you with this large byte letter…..I just hope that it was very helpful to some.